I read an article for one of my classes in grad school today. The article says that in July the Supreme Court settled the question of whether health care is a right. I don’t believe the question is settled at all. 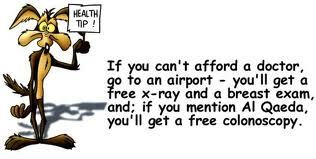 I spoke with another nurse a few weeks ago who said health care should be free. I pointed out that people paid her for healthcare, because that’s her job. So if health care is free, she wouldn’t get paid. Here’s a parallel: I think we would all agree that it would be a great thing if food were free. You know, walk into the store, pick whatever food you want, and walk out. The only question is: who pays the farmer? Who pays the guy who makes the equipment the farmer uses? Who pays the truck driver bringing the food to market? Who pays the owner of the building where the market is for electricity, heating/cooling, etc? Who pays the employees that stock the shelves? Who pays the people who make the packaging for the food? Who pays the inspectors that ensure the food is safe? The list goes on, and none of these people work for free. The same is true for health care. Ultimately what it comes down to is this: Health care is a service, and services cannot be guaranteed to anyone. Services are paid for. Can anybody name one service that is 100% free? I can’t think of any. Oh, sure, there are things that certain people don’t pay for, but they aren’t really “free” because someone is paying for them. And that’s what we have with our healthcare system: care that is paid for by other people. So when Jim goes to the hospital, and he has no money, he tells his Uncle Sam that he can’t afford health care, and his Uncle Sam gets Bob (who has more money than Jim) to foot the bill. So ultimately the question of health care comes down to economics: does the government have the right to take your money away and give it to someone else who they think needs it more than you?